The crash, which happened near Rural and University, did not result in any life-threatening injuries. 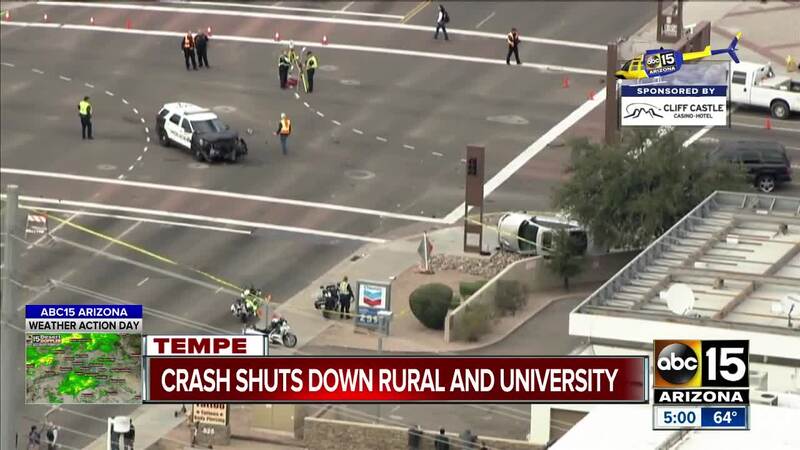 TEMPE, AZ — A Tempe police officer was involved in a serious crash Tuesday afternoon. The crash occurred at the intersection of University Drive and Rural Road just after 2 p.m.
Tempe police confirmed Tuesday evening that the officer involved in the crash was headed to an officer-involved shooting that happened moments before . The officer involved in the crash was headed southbound on Rural Road with his lights and sirens activated, according to a police spokesperson. Police say when the officer tried to enter the intersection at University Drive, the officer was struck by a vehicle heading eastbound into the intersection. A second vehicle then entered the intersection eastbound and also collided with the officer’s vehicle. The second collision then caused the second vehicle to strike a pedestrian on the sidewalk. A total of three patients, including the officer, were transported to the hospital with non-life threatening injuries, according to police. It's unclear if anyone will be charged in the crash.